If you are in the process of searching for a party bus in Monroe, then you can now bring that search to an end. Here at Rockstarz Limousine and Party Bus, we specialize in providing our clients with not only an amazing place to have a party, but an overall wonderful experience with the highest standard of customer service. Whenever you go to rent a party bus, you will want to make certain that there is enough space available for you to then invite all of your key guests. With our party bus, we have sought to make the most of the space on the bus to ultimately allow you to invite even more people than ever before. 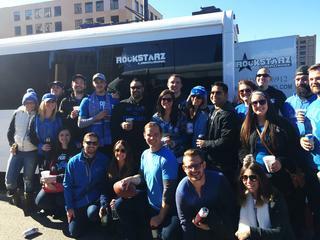 Our Monroe party bus rental option is going to provide you and your guests with the opportunity to experience being in your own private nightclub as you cruise around the city. From the moment you board, you will be transported into a completely different setting that will far exceed your current expectations. From the state of the art sound system to the light display that will blow your mind, this is a party bus that can deliver the ideal atmosphere for your party. Not only that, but we know the party could get too busy for you which is why we have also incorporated a series of leather seats to rest upon. In the past, individuals have used our Monroe party bus service to help them with a range of different celebrations. No matter if you plan on hiring us for a birthday or an anniversary or perhaps a party before your wedding day, we can help you with each and every occasion. So, if you live in the Monroe area and are looking for a party bus, then give us a call direct here at Rockstarz Limousine and Party Bus. Alternatively, you can contact us via our website and someone from our company will be in touch to discuss your requirements as soon as possible.